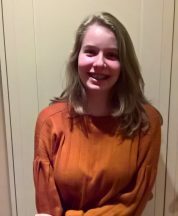 Interests - Faith loves cuddling her school guinea pigs, Music CD's (especially Doris Day/Ed Sheeran), Having hand/foot massages daily, facials and hair care (mainly being pampered!!) Audio story books, music/musical programs and You've Been Framed show because of all the laughter. Sounds of waves, sea, birds. Cannot read, but enjoys being read to. Likes hair accessories , body creams, shower/bath gels, nails painted by Mum. Faith is enjoying teen dvd’s, chilling on her bean bag, stroking Rosy our jackapoo dog who is warm and fluffy on her lap. Visually/hearing impaired? - Yes - Faith is blind but is aware of flickers of light. Suffers from any developmental delay? - Yes - Faith has severe global developmental delay and is immobile. Faith has a mental age of around 2 and a half to three years of age. Loves K pop and anything Japanese, she also loves YouTubers, the SIMS, baking cakes, reading (late at night) hamsters, her two "fancy" mice, chickens, chocolate, nail varnish, pop music, The Simpsons, pastel colours and Rosy our dog. Faith was born blind and severely epileptic. She had brain surgery when she was one to remove the focal point of the brain where the neurologists felt the epilepsy was originating from. Sadly they couldn’t remove it as it was on both left and right hemispheres of the brain. Faith was able to sit but as her epilepsy worsened she is now totally immobile and in a wheelchair. Her bones are fragile and crumbling and she is due to have a big hip operation in September 2011 as her femur is not formed properly and her hip ball and socket joint is malformed. Faith has a pulse generator in her chest with electrical currents constantly pulsating through a copper coil wrapped around her vagus nerve to try and control some of the seizures. Faith is highly medicated and is in a body brace and is fed by gastrostomy. She is non-verbal and her comprehension is limited. However, Faith is our beautiful angel. She is accepting and sweet. She listens to voices and her eyes sparkle when she is content. She loves cuddles, being sung to and having her hands and feet massaged. Faith’s really enjoyed Chinese New Year at school – smelling five spices, ginger and everything sensory! And has a new Cpap mask that doesn’t rub her face any more when she is wearing it at night, which is great as she sleeps longer. Mae studying for her mock GCSE’s and then the real ones. Not easy. She burns incense while studying. The house smells amazing ! Faith has been enjoying the sea air a lot recently, as we have been visiting the beach a lot. Nothing like fresh air to blow the cobwebs out! Faith has been admitted to hospital because of a chest infection but she is out now. She is struggling with hip pain too. So the OT and physios are working with Faith. She will be 17 in September, so a massive achievement. What an amazing person she is. Mae has another hamster to replace her old hamster. It’s a boy! Haven’t had boy hamsters before. An animal is a great way to help her relax. Mae has been baking and making her favourite stir fry. They’re both now back at school. Well Faith is putting on weight, which is good, but her seizures are so unpredictable still, which gives her headaches. Her skin is so sensitive at the minute and fragile, so we have to use gentle creams and bath creams on her, but she is as lovely as ever! Faith had a great birthday, 16! Cannot believe it! Thank you for all the great birthday cards from all around the world! Faith has been enjoying the sensation of baking chocolate brownies with her sister Mae. The smell of chocolate. Yum! Faith and Mae have been enjoying foot spas and foot creams together. Messy but super fun! Faith’s seizures are more frequent and we are keeping her away from anyone with any sign of a cold. Let’s just get through the winter! Faith has a cold and sneezing. We are nurturing her to make sure it is only a cold. Mae is getting super excited about Halloween. Hmmmm. Spooky. Faith loves to dress up as a witch and scare anyone who comes trick or treating at the door. Faith is almost 15. We cannot believe it! How wonderful this is. What a difficult year it has been and we are so excited to see her reach 15. Thank you to everyone sending postcards, letters and gifts. So special, thoughtful and kind. We all really appreciate it and can’t wait for our postman to come everyday. It helps us get through everything. Thank you Bev Higgins, Claudia Meyer, Hazel and Steve and all the super people who send incredible cards and best wishes! Faith and Mae think you are awesome. Faith is putting on weight which is fantastic. Always trying to help her control her breathing – especially at night – and back pain. Nothing like a massage to relax her. Mae now has another hamster cage, as her two dwarf hamsters started to fight and one was injured. After nursing her back to full health in a separate plastic box, the hamster got a new cage. Mae’s bedroom is now a hamster school, she does love hamsters! Thank you to everyone sending hamster treats. They go down very well. Thank you for the books you have sent as Mae loves to read. Faith has thoroughly enjoyed having nail art done. She looks extremely glamorous ! And she enjoys the sensation of having her nails done. Thank you to everyone sending the nail art and nail varnish. Great gifts. Just wanted to add in a massive thank you to Mr Moore for Mae’s fabulous books! Faith is gradually phasing in school starting with 2 hours on Friday! Faith is doing well considering what she has been through. Her breathing is so difficult and the respiratory consultants are working on a plan for a bipap cpap and nasal oxygen, as she is thoroughly exhausted just breathing!. Mae is enjoying baking, she made strawberry muffins recently and she ate them all before we got a look in! She also loves all 5 of her hamsters! Thank you for all the wonderful cards and letters of support. Please can everyone put their email address on their parcels so we can thank them! Last Saturday they moved Faith onto a portable ventilator, 3 PICU nurses and a consultant wheeled Faith in a hospital bed outdoors and along to Big Ben. Faith’s family cut a cake decorated by Mae and toasted Faith as Big Ben chimed, before returning to PICU. They surrounded Faith with pink heart balloons, handmade heart confetti and said their goodbyes. Faith was taken off the ventilator and was expected to have between a few hours and a day. Faith has now been off the vent for 8 days and is still fighting on. She has been moved out of PICU and to a palliative care bed. The doctors said if she survives this weekend then they will discuss discharging her to the school, where she normally boards weekdays. Faith is by no means better, she is struggling to breathe, is in seizure activity 85% of the time and only occasionally opens her eyes. They have now stopped doing any monitoring or interventions. The boarding school (which has highly trained nurses at all times) would be a better environment for her to spend her final time, however long that might be, and its closer to home for her family. Faith has now been in hospital for a month and it’s become clear that her little lungs have given up. It has been decided that her quality of life has deteriorated in the past year. 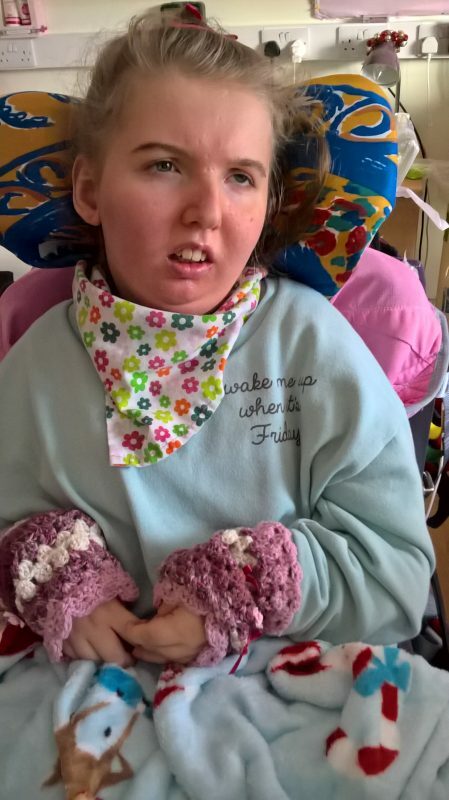 On Saturday Faith is going to be taken off the ventilator, given relaxing medication and let her slip away peacefully with her family around her. Faith was admitted to hospital on Boxing Day with a chest infection. Her airways kept collapsing and she had to be moved to PICU and put on a ventilator. Faith remains incredibly unwell, although she opened her eyes briefly today. Faith was admitted to hospital on Boxing Day and then again 2 days after, we are still here as Faith is suffering with a chest infection. Faith is on steroids and IV antibiotics for her poor chest. We will need overnight stays to do testing again, as her consultant really wants to review her, because her airways are collapsing. Thank you to everyone who sent lovely cards and messages, they really cheered Faith and all of us up. Faith has thoroughly enjoyed the lip balms as her mouth/ lips dry easily and the oxygen dries them even quicker. Mae loved the gifts for her hamsters and cheeky puppy Rosy. Thank you. Both girls thoroughly enjoying playing with Rosy our new puppy. Rosy loves sitting curled up on Faith’s lap and it keeps Faith warm too! Faith now needs to be nebulised twice a day and needs constant suctioning as her lungs are not functioning very well. She still puts a brave face on everyday, even though she struggles to breathe. A massive thanks to Skye from Australia this month for the vegimite chocolate! Spectacular! It was yummy and is all gone. Hopefully she received our thank you emails and her animated cards too. Faith has been amazing this week considering she has just been in hospital for over a week with her uncontrollable seizures and then chest infection. Faith went in to hospital for a jejunostomy (stomach tube) and more bisphosphonate infusions (3 times 5 hour ones) for her osteoporosis. It is difficult for her as she suffers with general anaesthetics and gets a fever with the infusions, so we all hope she feels more comfortable very soon. Thank you for Faith’s lovely paper cut gift through Post Pals. We had a fabulous time at the annual party last weekend too! Faith continues to smile, so we are really delighted and trying to take photos all the time to catch them. Faith is thoroughly enjoying her baths and painting her nails. Soooooo girly. Mae helps too and is a great sister looking out for Faith and when she needs suctioning, she helps do it too! Faith still needs loads of suctioning all through the day and night. It keeps us very busy, especially the 2 washing machines which do at least 4 loads each a day! Mae went on a day trip to France with school up to a light house, ate lots of chocolate, then came home again! I think she practised her French. Both girls are enjoying baking cakes (anything with chocolate) and making smoothies. They are also addicted to Britain’s Got Talent and we are all enjoying watching it together. Thank you to Claudia for your updates on cute little Ella! She is soooo gorgeous. A massive thank you to Skye in Australia for the slide cards you sent with the animal sounds. So clever and a brilliant gift. Thank you everyone for being so lovely, kind and positive. Post Pals is a fantastic part of our life and we all feel happier for being a part of it. We really do feel lucky. Faith is still smiling and we have had three chuckles now! This is the best thing ever! They are quiet chuckles, but it still counts and we are all thrilled and so happy for her. Faith made meringues at school and played with some Angel Delight again (strawberry is her favourite smell). Last weekend she had her toe nails painted all colours of the rainbow and her hair plaited and sparkly clips put in. She looked a fabulous teenager. Although I would say that as I am her mum! Faith is due to have an operation in July on her stomach. We are waiting for more details. Five days in hospital. No one is looking forward to it, especially Faith. Mae is all examed out. She said she needed lots of chocolate to help her revise. Any excuse! She had her hair coloured pink at the end – a lovely kind Post Pal sent a box of sachets to dip and dye your hair. We did accidentally get it over Mae’s clothes – but it all came out in the wash. Faith got a lovely nail varnish from a Post Pal this month, thank you. Thanks also go to Ligang from China for the owl necklace and to Baoshiji from Shenzhen China for the owl purse. Now she is a teenager, Faith is really into having her hair done, accessorising with bows, clips and plaits. She loves having her nails painted – rainbow toe nails are in at the moment! We eventually got around to buying a tangle tamer. They are the best! No more bed hair in the morning. Faith is smiling, especially when the bubbles (spa bit of her bath) is switched on. We have been busily taking photos of these absolutely magical and golden moments. Mae is busy growing taller! She is really into unicorns and now back into My Little Pony series. I always say, you are never to old to watch 4 hours of My Little Pony on tv! I have to stop her otherwise she would get square eyes. Mae enjoys chasing the chickens around the garden and helping collect their eggs. We love eating boiled eggs! Faith has been using the suction machine a lot recently, but wonderfully this hasn’t stopped her smiling. Faith has been smiling the past 4 months now (a big gap before then of 8 years when we had the last proper smiles) and last night Faith actually giggled. We almost caught it on camera. A wonderful golden moment for Keith and I. Mae was asleep in bed at the time. We are all making chocolates at the moment – melting chocolate so the house will smell great over the Easter Weekend. A big thank you to Caitlin in Shropshire for the wonderful CDs you send, the soft cuddly dog and audio story book. Faith loves holding the dog in her hand and we have all listened to the audio story book and CDs many times. Thank you Caitlin! Thank you Marioh Erdelkalup from Germany!! I hope we have spelt your name correctly. Thank you to Claudia, Jens and Ella, for your Easter gifts! Thank you Post Pals from Faith and Mae for the Easter card and yummy Easter Egg. Faith has just about got over her pneumonia. We’re still suctioning a lot but really improved. Faith is just starting to get some fresh air – wrapping up well and getting the sun spot in the garden! She loves listening to the birds and especially our chickens clucking (and Mae chatting of course). Thanks Becky Butler for the super book. Mae ripped open the package and has had her head stuck in the book all evening. Hiya lovely Claudia Meyer. Ella looks soooo lovely and growing up beautifully. Mae loved the owl cut out. She (the owl that is) is sitting happily on our window ledge. Thank you from Faith for all the caring and colourful letters and lovely messages. She loves having them read out to her from all over the country and world. Thank you to Caroline for the rucksack, hair bands, cool pack and book too. Faith was due to have Biphosphonate infusions at the Evelina for her osteoporosis but we had to cancel them as she was ambulanced to hospital with unmanageable siesures and put on iv epilepsy drugs, as her ones and other emergency drugs administered at home weren’t getting her out of her seizuring. By chance they did a chest x-ray and found she has another chest infection, so it’s iv antibiotics. Poor Faith, she is really going through it, especially as her veins constantly collapse and so it was a miracle they managed to get a line in. Faith has just come home and is on a course of strong antibiotics through her peg. She’s sleepy but on the right track. Mae and the hamsters are glad to have Faith back as Mae gets very stressed seeing Faith unwell. Keith’s ‘man cough’ is also recovering and all is hopefully settling down now. Thank you to everyone for their hamster cards, lovely messages and postcards. Thank you Claudia and Becky Butler (please can we have your email). You really make our family life better through your kind thoughts and cheerful messages. Thank you again. Faith going into hospital for 4 days for iv biphosphonates as she is severely osteoporotic and hopefully this course will help her get some more strength in her bones. Her hip and leg have turned out recently so we are seeing the consultant and possibly more x-rays. Faith has finally recovered from her chest infection starting in October. She has had some smiles over the past 2 weeks and we are loving it as it is so rare. Faith loves massages of her legs and feet with creams – she gets great pleasure from touch. Mae is getting used to secondary school and lots of nice friends. Mae’s hamster (Popcorn) very sadly died at Christmas time and Mae was devestated so we bought two little dwarf russian hamsters called Yin and Yang. We now have a Syrian called Violet and the 2 little ones. So sweet and fluffy and all very busy on the wheels at night! I think we need to get the free standing ones so we can get to sleep. Mae loves her animals. Faith enjoys feeling their fur too. Thank you everyone for the spectacular Christmas cards you sent and their special messages from England, Australia, Korea. Amazing! Thank you for your gifts and cards Rebecca Butler! Mae loves the pencil case and the heat up owl – she is definitely going to school with the pencil case this week. Please can you send us your email and address again as we have lost it! Thank you to Becky Rideout for Faith’s cd too as we have listened to it lots of times. Please can we have your email and address too Becky! And lastly, hiya Claudia! Hiya to Hazel and Bev too! Faith has just recovered from a chest infection. We were in hospital for chest x-rays but all is okay now. Phew. We are very excited for Christmas. We have the advent calendars at the ready! We will attempt to bake a gingerbread house next week! Could be interesting and messy. Thank you for the post recently. We got fab Christmas stickers from Kirstie, thanks!! Thank you to Regina from Switzerland for the super soft and fluffy neck scarf, it is so perfect to keep Faith warm on chilly days. Thank you Bev for the parcel for the girls! I have just got it and will hold on to it until tomorrow! It’s super exciting and beautifully decorated with stickers. Thank you to Claudia for Mae’s Christmas calendar card, she loooooves it! Faith is enjoying baking cakes at school and listening to the British Bake Off on television with her sister. The family are addicted to making our own chocolate chip cookies at the moment. Faith sampling the melted chocolate of course! Mae helping at any opportunity to sample as much chocolate as possible too! Faith has also been enjoying walks out with her wheelchair, crunching over the autumn leaves (and dodging dog poop!) and loving being a teenager! This is a very exciting month for Faith. She becomes a teenager! Thirteen on the 13th September. Faith went on the London Eye and a London Thames Cruise for an early birthday trip with the family. She loved all the sounds and wind in her face. Very windy on the Thames! Mum will try and make a London Eye cake for her birthday – try is the word. Faith has enjoyed the last few days of summer holiday going for walks in her wheelchair to the local parks and lakes with her sister Mae. We saw some ducks today and lots of friendly dogs. We always have to stop and stroke them. Faith has finished another year in secondary school, it was a wonderful celebration day and a certificate was awarded to Faith for her good communication skills with the school ipad! Well done Faith. She has been pampered thoroughly so far this summer holiday – nails and fingers painted lilac, and her hair in plaits, bunches and amazing styles. Well, she is nearly 13! Mae has been swimming and in the paddling pool in the garden, playing with her build a bear and styling Faith’s hair. Oh and of course, the compulsory lounging around in your pj’s for as long as you can while watching tv! Faith is doing well at the moment. She’s still struggling with managing her seizures though. Lots of new meds are being tried to try and prevent Faith getting stuck in her seizures. Faith is now only just tolerating her feed properly after her spinal surgery back in November. Horrid reflux and not taking in enough fluids meant she was over heating. We have been very gradually increasing it so she doesn’t gag too much. Otherwise it is projectile milk everywhere! Faith has been very productive at school making a paper Easter chick basket, a fluffy tailed Easter bunny poster, and planting seeds. Faith loves to cook with chocolate (loves the warm smell of chocolate melting) and the feel of it in her fingers. Anything messy really! All tactile. She is having hydrotherapy at school which gives her the freedom to move easily in lovely hot water, it is so good helping her muscles relax. A real mermaid floating around. Faith and Mae will have an Easter egg hunt around the garden, although they know all the good hiding places. Nothing like being outside for a bit of fresh air as it blows the cobwebs out. We will also be making some Easter chocolate lollies – again, melting chocolate!! Mae is keen on hamsters (as she is a very responsible owner of her hamster, Popcorn) and at the moment is interested in (addicted to) McDonalds monopoly stickers. Faith’s surgery was canceled after we had left for the hospital. She will now have it this week. 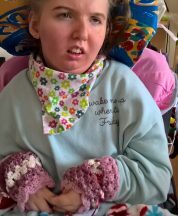 Faith will be going into the Evelina hospital for her surgery on Wednesday 2nd October 2013 to have her spinal surgery on Thursday 3rd October. She will aim to be in the Evelina until Monday 7th October provided she doesn’t have any lung complications as with her previous operation. Faith is having another spinal surgery and it should happen within the next 12 weeks. She is having some bolts cut off /shaved and some moving /adding of others in the lumbar region. The reason for this surgery is because Faith can only currently sit in her wheelchair for an hour before having to come out of it and side lie as her lower back swells up and she is in pain. This makes it impossible for Faith to ever go anywhere and also the fact that Faith is now unable to tolerate lying on her back because of the pain. We don’t want Faith to have to go through the pain of an operation again so we’re feeling really sad about it all. Faith is just recovering from her gastro peg replacement operation. Her back is improving from the spinal surgery – but we still have to have her lying on her side after every 1 hour in her wheelchair as her back begins to swell up! Never mind. She went for a walk in her wheelchair in the sun today. Almost ran over a dead frog! Poor thing. Faith is having a pampering haircut session in ten minutes and then snuggled up to bed. She loves a head massage and I will give her a foot massage too! Mae is running around the house very loudly and will have a hair cut too. Both enjoy playing in water. Mae leans over the bath when Faith has one and helps shampoo her hair. Faith has the cleanest hair in the house (at least a hairwash a day!). She will have her nails painted later too. Mae is busy eating chocolate from Easter! And ‘busy doing nothing’ she tells me! We have central heating now too. Six weeks with a broken boiler and only fan heaters to warm us all. Luckily Faith has an electric blanket! Daffodils and other flowers are out in the garden. We love bringing them in to the house for everyone to enjoy, especially smelly ones (roses etc) for Faith. Faith is recovering well from back surgery. However, she has a swollen lower back. The screws from the spinal pinning seem to be in place, but one may be rubbing the skin around it. Faith can enjoy her baths now and being at home with her family and Mae. Faith loves the Christmas lights and is busy listening to Christmas music and Mae, her sister, pulling numerous crackers! Merry Christmas to everyone at Post Pals and thank you! Faith is having her VNS (vagus nerve stimulator) battery in her chest changed in Kings Hospital in the middle of April. She is also on the list for major spinal surgery. We will only be given 8 weeks notice prior to surgery and it will have to happen before this November 2012 when her severe scoliosis (crushing her organs) will have fused so surgery cannot happen after then. She will have 6 months to a year recovery. We are all extremely anxious but will have to wait for the date that could be any time. Her seizures are also keeping us very busy all through the nights at the moment. Not good for the bags under my eyes. Debbie sends lovely cards and gifts to the girls. She is great. Claudia from Germany has sent us Lush cosmetic products so our house smells divine. Mae is crazy on cooking at the moment and drawing. Faith is enjoying the music cd’s people send (thank you all!) and being pampered. Thank you to all of the wonderful people sending cards and gifts as it makes our day. The post is so exciting now! Hope you all are okay and Happy Easter. Thank you ever so much for the Halloween packs. We had screams of delight from Mae, and Faith had her ‘interested/what is going on’ face! Mae is putting the sticky bat and spiders in the porch already! They loved the spider web, bubbles and glow sticks too! It was a great surprise, thanks. Mae loves the skull ring lip gloss and Faith has ‘tracked’ the wonderful pumpkin glow stick. The best ever gift bags I have seen. It must have taken lots of hard work getting everything together. Tomorrow we are making the ghost chocolate lollies from the book! Faith is getting a bit better every day. We’re just waiting to find out if her 2 scars are infected. She also has thrush from the antibiotics – not surprising. Faith still has a temperature and is off epidural now. She is being sick but they are not sure if it is the morphine or infection. They will decide if we come out tomorrow (Friday) but it’ll probably be Saturday or Sunday. I will keep you posted. Thanks for our post. Mae loved the Japanese card and we’re going to find out what it says. Faith has had her pre op assessment (bloods, X-rays, etc) and it is all go for the hip reconstruction on 11th October! Faith has enjoyed being in the garden lately with her feet in a bucket of cool water. Her sister Mae joined in and splashed everyone. The cards, personalized or handmade, are super and so so clever. Thank you everyone for your kindness. All letters are so lovely to receive and exciting to see them arrive by the postman. Faith received a super light up lamp – thank you. It is a multicoloured lava /glitter lamp and is brilliant. It can go right up to her face and lights it up and Faith loves it! We have also just received the letter about Dotty the Dalmatian and the girls are both so excited about getting a puppy in the post! Thank you. Faith is having a complicated operation on 11th October. She is having her leg (femur) broken and a triangle taken out of it and a bone graft from her hip bone to reform her ball and socket joint. She will have to have rehabilitation for a month and lots and lots of pain killers. This is because her bones are like honeycomb and crumbling inside and her hip is about to dislocate if she does not have this operation to re-align it. Please could everyone send her good luck and wish her well for the operation. It has been a year in the planning and fingers crossed it all goes well.